Forty-eight-inch ranges have become very confusing to buy. You have a vast array of options. They break down this way: BlueStar, Capital, Thermador Harmony, Viking, and Wolf. 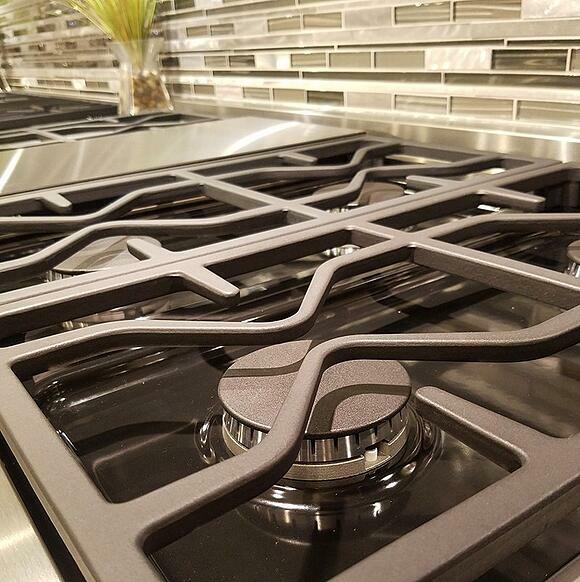 Basic gas ranges have simple controls and limited functionality. They are designed like the original commercial ranges. In dual fuel, like Wolf and Jenn-Air's ranges, add a clock, timer, and other functionality similar to a decent kitchen range. Thermador, Dacor, and Miele offer better features. Dacor and Miele especially offer guided cooking, some steam functionality and other features unavailable in other ranges of any kind. To understand which is better for you, we will look at both companies, the technology, and both ranges. Then you can judge which range might fit your needs. 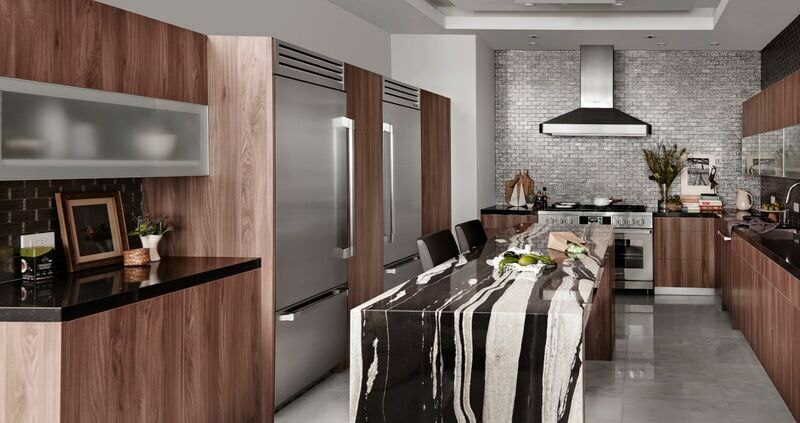 American-made and family-owned, Dacor has been designing and manufacturing appliances for three generations. Stan and Anthony Joseph founded the Stananthony Corp. in 1948. In 1965, Stananthony became Distinctive Appliance Corporation, also known as Dacor. From 1975-2013, Dacor has produced many appliances from modular cooking systems to the first smart wall oven. They were the first with the internet connected range. Samsung bought Dacor in 2017 enabling technology to continue being Dacor's forte. The Miele Company is a European based company with many factories throughout Europe. Carl Miele and Reinhard Zinkann founded Miele & Cie in 1898 which was and still is an independent family-owned company. Professional ranges were released in 2015. They feature their MasterChef and steam assist automatic programs, which aid in your cooking whether you are baking bread or cooking meat. Miele has been more manufacturer driven. They still produce most of their parts rather than outsource them, unlike most manufacturers. 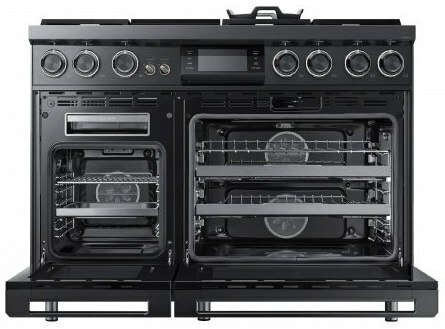 Let’s take a look at Dacor’s and Miele’s 48-inch dual fuel professional ranges. An app called the “IQ” created for Dacor ranges to download recipes, store favorites, get menu ideas with recipes, and even have a remote diagnosis. Self-Clean and Steam clean conserves energy and cleans without any harsh chemicals. Dacor ‘s control panel is essentially a Samsung tablet. You can play Pandora, surf for recipes, and have full internet access. The range can also text you after set durations of time or modes are completed, so you do not have to stay in your kitchen all day. The oven alerts you. Miele does not have internet capabilities but has the more functional technology. Their MasterChef controls allow you to select a food, your preferred doneness, and then cook it to perfection with just a touch of a button. Dacor's interface has nice images of food you can cook but no guided cooking to achieve that result. Both of these ranges are “tech-heavy”. They both require the use of a control panel to use the oven. If your goal is to create food easily, the Miele control panel is more function focused and easy to navigate. However, you can only surf the internet for recipes with Dacor. 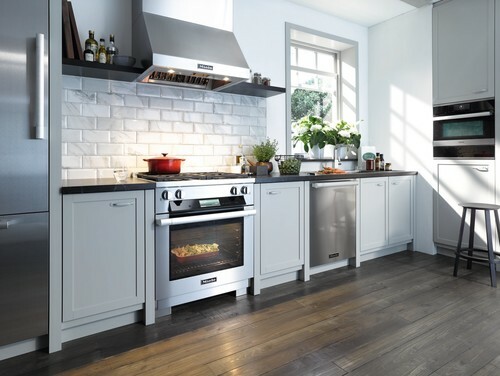 Miele's offers 48-inch ranges with a few surface options: 8 burners, 6 burners and griddle, 6 burners and grill, and four burners with grill and griddle. Miele’s most powerful burner at 19,000 BTUs. Miele’s burner can also achieve a low simmer. 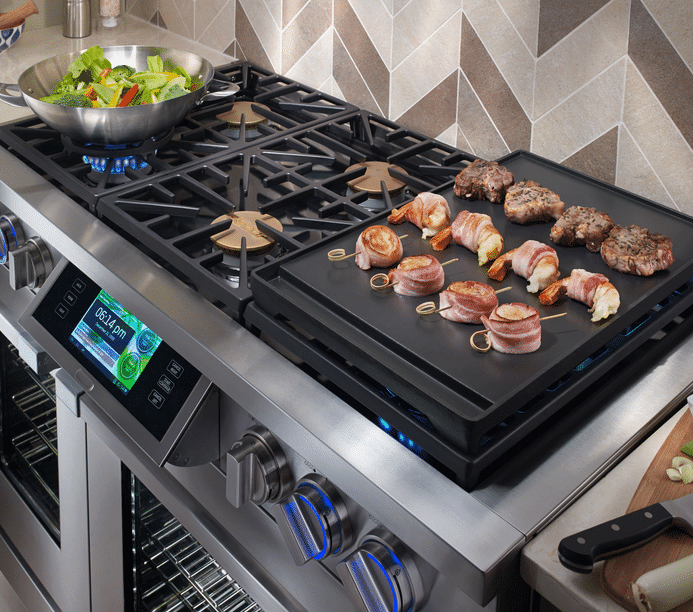 Dacor has a technically more powerful top with a 22,000 BTU and several at 16,000 BTU. Miele has an infrared gas grill, which is the fastest and easiest to clean. They also have the gas griddle. It will be faster than the Dacor. Miele has a speed oven and warming drawer instead of a second oven. The speed oven is a microwave convection, so you can cook microwave, convection or both to save time. Miele's main oven has the steam assist. Steam is a great finisher to harden foods or add the crust to bread. Never baked bread before? Miele has automatic programs for 16 types of bread. They also have a warming drawer that keeps food warm for up to 3 hours without dehydration, which is useful if you like to entertain. 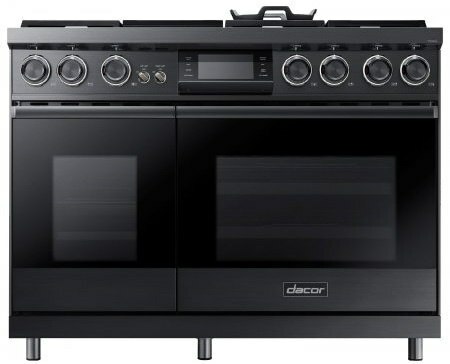 Dacor has a twin convection oven without steam, but adds a steam oven on the side. This may be confusing but you are comparing a larger steam assist oven versus a steam oven and a smaller speed oven against a larger convection oven. Dacor's 3-year warranty is one of the best in the industry. Miele is only 2 years. Miele is known to have the best quality control of any manufacturer because they make their own hardware and electronics. Because of this, they are known to be one of the most reliable brands. 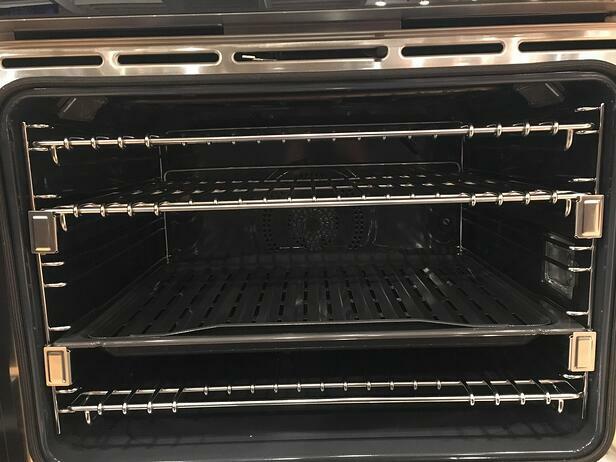 Dacor has the better warranty, but you will more likely need to use it. To be transparent, we have not carried Dacor in recent history. I am curious to see how the brand performs under new ownership. Neither brand offers much for service, so make sure you buy from a company with repair services. You have to love the WiFi, the smart new finish and the enhanced burners. The second oven with steam is a good idea. The oven control panel does not have as many “bells and whistles” however is still function focused. The MasterChef just simplifies every cooking function. Miele's guided cooking is easier and more transparent than the Dacor at this moment and time. It is very easy to use. It depends on how you cook like any similar products. However, you need to to see a demo on both including food to truly see the capability of each before you buy. Miele is more proven, but Dacor will be interesting especially in the future with Samsung developing the technology. Want to learn more about Professional Ranges? Download the Yale Professional Cooking Buying Guide with features, specs and inside tips to all the brands like Wolf, Thermador, Dacor, Miele, Viking and more. Well over 240,000 people have read a Yale Guide.